Gmail's IMAP support roll-out this week had nerds all atwitter about the possibility of synchronized email access across devices, computers, and clients. IMAP is far superior to regular old POP for fetching your messages and maintaining your folder list whether you're on your iPhone, office or home computer. If IMAP's got you curious but you're not sure what desktop application to use with Gmail, consider the extensible, fast, cross-platform and free Mozilla Thunderbird, our beloved Firefox's little sibling. 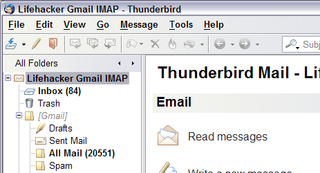 Here's how to get the full Gmail experience in Thunderbird with IMAP. Internet Message Access Protocol (Wikipedia page) enables email programs to read messages stored on the server. Unlike POP, with IMAP it's as if you're browsing a network drive of files on a remote server with an open, live connection to that server; whenever you open a folder or view a message, it's displayed from that server live. IMAP maintains a constant connection with your server and updates real-time. Why is IMAP better than POP? POP downloads and copies new messages to your local inbox. With POP you can download once and disconnect from the server, which is its one advantage. But you cannot download messages that have already been archived and labeled in Gmail via POP, and your client has to poll the server to get new messages. With POP access, if you move a message to a folder or star it in your desktop client, that change is not reflected in Gmail and your messages get out of sync. Any rules or mail filters you set up on one machine with a POP client have to be set up and reprocessed with a fresh download on all your other machines. Think of POP as copying files from a server to your computer and working with them on your hard drive. 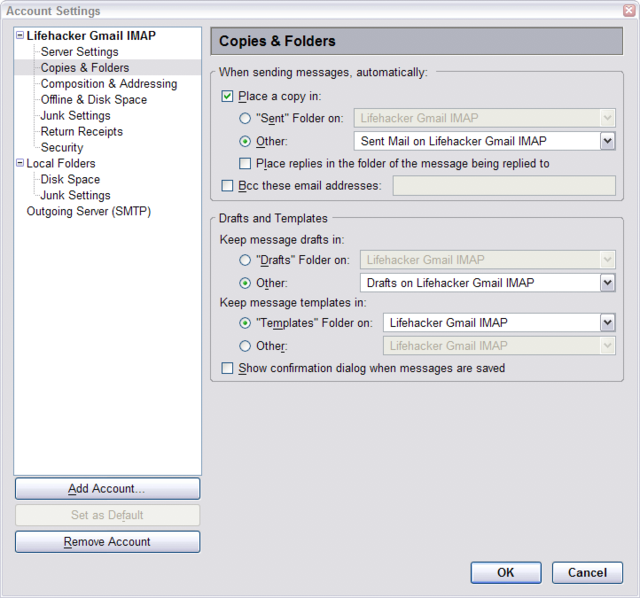 Think of IMAP as connecting to a remote server and working with the files saved there. Why Thunderbird (and not Mail or Outlook)? It's extensible. Like Firefox, a wide variety of optional Thunderbird extensions can add features and functionality other clients only dream about. It's free and cross-platform. You work on a Mac? PC? Linux desktop? Unlike Mail.app or the various flavors of Outlook, Thunderbird just works everywhere. Plus, there's a handy portable version that can run from your thumb drive, too. First things first. Once you're fetching your email via IMAP with Thunderbird (here's Google's tutorial on how to do that), there are two settings you'll want to set manually: specifically, where Thunderbird should store sent messages and drafts. In your IMAP account settings, the Copies & Folders area, be sure to change the default location for Sent and Drafts to [Gmail]/Sent Mail and [Gmail]/Drafts respectively, as shown. From the Tools menu, choose Options. Go to the "Advanced" Option menu and the "General" tab. Hit the "Config Editor" button next to the "Advanced Configuration" label. Now you need to look around in there a bit to find which server you need to modify. Using the filter entry box at the top, type in mail.server.server and you will see a list of keys and values. One of those keys will be mail.server.serverX.name, where X is a number and the value is the name of your Gmail IMAP account. Remember X.
Right-click somewhere in the box and select New->String. Go to Gmail's web interface and delete the label [Imap]/Trash.